The Bridge debuts tonight on FX at 10 p.m. Eastern with a 90-minute pilot. The Bridge is a smuggler. On its surface, it’s a bright, sun-seared potboiler, a pulpy dive into the dark violence perpetrated by Mexican drug cartels, with a healthy dollop of serial killer thriller. But underneath the surface, there’s lots more going on. There’s a look at the struggles of living with an isolating mental condition, particularly when you don’t have reliable guides to steer you true. There’s at least a surface-level examination of American immigration policy that promises to get deeper as the series goes on. And at all times, there’s a thoughtful consideration of the U.S.-Mexican border, a place where it’s easy to get lost or lose one’s footing. It’s this lattermost quality, which only gradually reveals itself, that suggests The Bridge will be a keeper. Based on the Danish series Bron, The Bridge takes its inciting incident and much of its plot trajectory from the earlier show, though the local flavor has been updated to such a degree that it easily seems as if this story has always existed on the border between El Paso, Texas, and Ciudad Juarez, Chihuahua, Mexico. In the opening moments of tonight’s pilot, the lights to the bridge between the U.S. and Mexico are cut, and a mysterious car drives out onto its expanse. The body of a woman is placed directly on the border, and the car speeds off. In less than five minutes, whomever was driving the car has created an international incident that will prompt task forces and a cross-border team-up between unlikely police officer partners. And to top it all off, the woman at least initially appears to be an El Paso judge whose rulings angered the local Latino community. When the body is lifted, it splits into two, and later, it’s discovered to be two halves of two separate women, the judge and a Mexican woman, further forcing cooperation across the border. It’s, to be honest, a little bit cheesy. The “mismatched partners” dynamic is one of the oldest in the book, and the killer’s plot—or, to be accurate, the mastermind of this scheme’s plot—frequently beggars belief as to how easily he or she could be in seemingly several places at the same time. But time and again, the series’ setting saves it. The original was set on a bridge between Sweden and Denmark and revolved around political concerns between those two nations; setting the American version in El Paso turns out to be a masterstroke, allowing the series to delve into immigration policy that much of the rest of TV is afraid to even touch. The mastermind, see, has a political point to make, one that will only be teased out slowly, and over time. That point will incorporate lax Mexican police work, the dead girls of Juarez, and the simple fact that Americans just don’t care very much about what’s happening directly across our southern border, when we very much should. The trickiest, most divisive thing about The Bridge is its central character. As Detective Sonya Cross, the American officer working the case, Diane Kruger is intentionally off-putting and awkward, her conversational skills stiff and her mannerisms seemingly learned. It’s heavily implied she’s somewhere on the autism spectrum, but the show never comes out and gives her a diagnosis. (In this interview with Alan Sepinwall, series co-executive producer Meredith Stiehm suggests this was an intentional bit of back-story; FX’s own promotional materials say Sonya has Asperger’s.) Kruger is riveting in the part, but the character can be hard to take, creating a kind of cringe drama, where her behavior is so pedantic and certain of its own righteousness that she turns off everybody around her. To the show’s credit, it’s not portraying a serious mental condition as something that collapses into a series of wacky tics; somewhat less to its credit, there are scenes in every episode where it seems like Sonya is finally, in her 30s, learning how to be human, thanks to teaming up with her new partner. Far more interesting are the moments where we watch as Sonya simply exists in this world, relying on self-taught skills and the help of a sympathetic boss (Ted Levine). Still, there will be viewers who simply can’t stand Sonya, and not toning her down is an impressive gamble for the show to make. A mismatched buddy cop show wouldn’t be anything without a good partner for the main character, and as Detective Marco Ruiz, Oscar nominee Demián Bichir makes his half of the series and his side of the border just as interesting. The pilot spends sadly little time in Juarez, choosing to focus on the initial events of the investigation in El Paso, but in the other two episodes sent out to critics, Marco’s life comes into sharper focus. On the one hand, he’s meant to be the human face to Sonya’s investigative genius, but if that were all he was, he wouldn’t be a character. Over time, Marco’s disappointments and regrets, his frustration at being stuck in a police system that frequently doesn’t investigate particular cases because there are simply too many murders to investigate (and thanks to drug cartels leaning heavily on the cops to stop those investigations from happening), all coalesce into a vivid character. Marco is warmer and friendlier than Sonya, but he seems to be hiding much deeper, darker scars. The most frequent point of comparison for The Bridge has been The Killing. Both take murder mystery cases that could be wrapped up in a season (and Stiehm promises in the Sepinwall interview that this case will be solved in season one) and make them the center of the proceedings, and both are fairly closely adapted from Danish originals. But where The Killing went wrong in season one (and, intriguingly, has increasingly gone right in season three, though no one’s paying attention anymore) was in making the murder mystery the sole reason for its own existence. Who killed Rosie Larsen? wasn’t just the show’s central question; it was the whole show, give or take some repetitive notes of grief around the show’s edges. 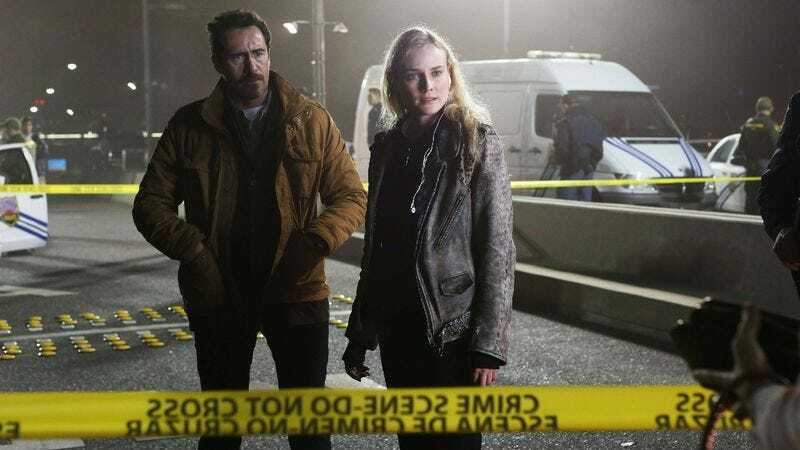 Where The Killing treated its central crime with hushed seriousness and a weird reverence, The Bridge respects its audience enough to admit this is all a little pulpy, to slip some mordant gallows humor around the edges, particularly in Sonya’s reactions to things. The chief difference, though, is that The Bridge allows for humanity and character to pop up around the edges. There are very few characters in this show who don’t make instant impressions, no matter how few lines they have, and there are very few people populating this world who don’t seem as if they could have a whole show built around them. There’s a weirdly mustached macho man who works with Sonya, a portly cop with braces who takes great pride in finding the judge’s other half, and a mysterious loner out on the fringes of El Paso who can’t quite shake his past. And every time the series seems about to back itself into a corner—as with a storyline centered on Annabeth Gish as a new widow that seems at times like a weird homage to the Miranda Richardson material in Rubicon—it finds a way to incorporate that storyline back into the main thrust of what’s happening. At all times, one is reminded that Stiehm and co-executive producer Elwood Reid are smart character writers, capable of filling in people with just a few words of dialogue, and that makes any plot bumpiness (and there is plot bumpiness) easier to swallow. Stiehm was one of the best writers on Homeland (responsible for what is still probably the series’ best episode, “The Weekend”), and she always seems to intuitively understand on that series that the loopiest plot twist could work if it was grounded in believable character interaction. She and Reid have carried that lesson forward to The Bridge, but they’ve also found a way to make a show that should feel overstuffed—it is, at turns, a police procedural, a noir-ish thriller, a series of smaller domestic tales about troubled loners, a serial killer story, and a newspaper drama about a dying industry—feel as if every piece of it is integral to the whole. 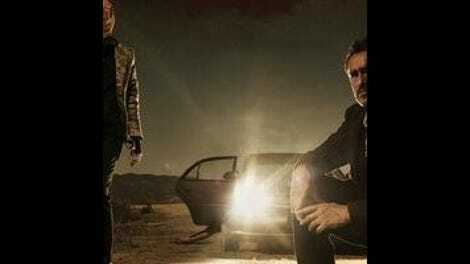 And at all times, it’s because both writers realize, for all of Kruger and Bichir’s talents, their true main character is the unrelenting bleakness of the Texas desert landscape, the divide in character between two cities separated by a river, and the way the desert night seems to swallow all light whole. By using the trappings of pulp, The Bridge smuggles in a whole host of other concerns, and in the moments when the viewer realizes how skillfully the show has done this, it becomes something special indeed. Watch this space for weekly reviews from Molly Eichel. My grades for the series’ first three episodes: B+, A-, B.